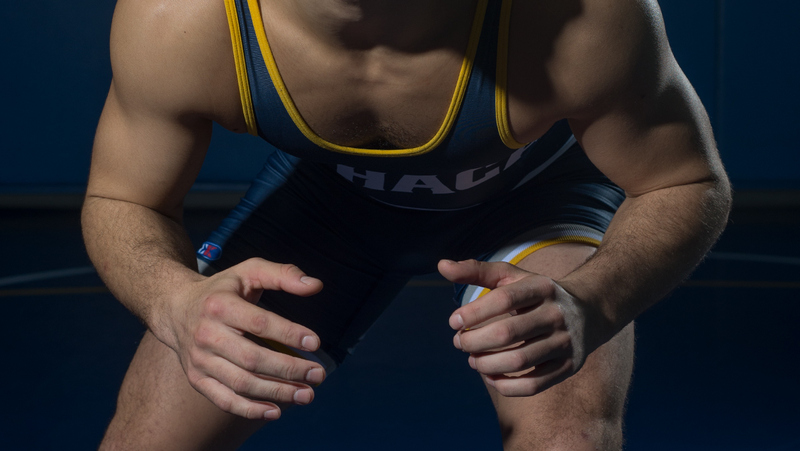 The Ithaca College men’s wrestling team qualified six wrestlers and two alternates for the national championship at the NCAA Northeast Regionals Feb. 25–26. Of the Bombers’ ten entrants into the competition, nine advanced into the second day and eight members of the team advanced to the semifinals. Freshman Sammy Schneider, junior Jaison White and senior captain Carlos Toribio each earned NCAA Regional titles. The Bombers finished second overall with 139.5 points. In addition to the champions, sophomores Jake Ashcraft and Jake O’Brien, junior Nick Velez and seniors Jimmy Kaishian and Nick Wahba were all named All-Regional honorees. First, for the fourth-ranked team, captain Kaishian defeated senior Earl Roberts of the United States Coast Guard Academy in a 13–11 decision. Kaishian was defeated by junior Bobby Jordan of Johnson and Wales University in the final via a 9–4 decision. Sophomore Ferdinand Mase competed at the 133-pounds level. In his first match, Mase scored a 16–0 technical fall against Plymouth State University sophomore Adam Correia. Mase then lost a 5–3 decision to SUNY Cortland junior Maverick Passaro. However, Mase defeated Williams College sophomore Ben Morton in his first consolation match, so he faced Springfield College freshman Ian Tolotti in the wrestlebacks. Tolotti emerged victorious with a 7–2 decision. Wahba was one of two Bombers to win three times in the first day of competition. As the top seed at the 141-pound level, Wahba defeated sophomore Grant Sorensen of Trinity College with a 12–1 decision to begin the day. In the semifinals, Wahba faced sophomore Joe Ferinde of Johnson and Wales. Ferinde won the match via a 1–0 decision. Wahba defeated senior Matt McAllister of the United States Coast Guard via a 6–4 decision. Freshman Sammy Schneider continued his impressive debut season. At the NCAA Northeast Regionals, he competed at the 149 pound level. In his first match, he defeated freshman Raffaele Masi of Castleton State via a 20–5 technical fall. Schneider faced junior Carter Armendarez of Wesleyan in the semifinals, defeating him with a fall. Velez made his way to the 165–pound winners bracket. Velez defeated sophomore Nick Remke of United States Coast Guard Academy via a 11–1 major decision in the semifinal. However, Velez was defeated by senior Stephen Jarrell of Johnson and Wales University via a 7–4 decision. At the 174-pound level, White won twice on Saturday to advance to Sunday’s competition. First, White defeated sophomore Josh Nelson of Western New England University via a 11–3 major decision. Then, White narrowly defeated freshman Taylor Shay of Roger Williams University via a 3–2 decision. White defeated senior Mike Palomba of the United States Coast Guard Academy via a 9–7 decision in the semifinal. White then defeated senior Mike Labell of Johnson and Wales University via a 6–3 decision to win the championship. Ashcraft won three times on Saturday at the 184-pound level. On Sunday, Ashcraft defeated freshman Mike Di Nardo of Johnson and Wales University via a 6–2 decision in the wrestleback semi before falling to junior Deuly Espinal of SUNY Cortland via a 6–3 decision in the third place match. At the 197-pound level, Toribio won twice to advance to the semifinals. In the semifinals, Toribio defeated the nationally-ranked sophomore Khamri Thomas of Johnson and Wales University via a 17–6 major decision before defeating senior Devon Carrillo of Wesleyan College 10–8 in the first sudden victory. The victory earned Toribio the championship at the 197-pound level. At the 285–pound level, O’Brien won thrice. In his first match, O’Brien scored a 8–3 decision victory over freshman Nick Scott of Castleton State. In his second match, O’Brien defeated senior John Georges of Rhode Island College 7–2. In semifinals, O’Brien defeated senior Kyle Foster of Roger Williams University via a 10–6 decision before falling to junior James Bethel of SUNY Oneonta via a 6–1 decision. The one weight class that did not have a member of the Blue and Gold advance to Sunday was the 157-pound level. Freshman Ben Brisman defeated sophomore Jack Reilly of Trinity College in his first match, before he was defeated by senior Bobby Dierna of SUNY Cortland. Next, the Bombers that advanced will wrestle at the NCAA Division III National Championships March 10–11 at the University of Wisconsin at LaCosse in LaCrosse, Wisconsin.